Mutated viruses have long been the bogeyman of science fiction films, but in the case of Ebola, mutation could be its downfall. New research suggests the virus’s own tendency to mutate could one day lead to an effective treatment. Researchers at the Texas Biomedical Research Institute believe they might have discovered a potential way to treat Ebola. The drug that inspired them is ribavirin, which is already being used to treat hepatitis C. Their experimental results suggest that the way to take Ebola down is to cause it to mutate, thereby turning the virus’s best weapon against itself. They published their findings in the Journal of Virology. Ebola is an RNA virus, one that encodes its genetic material in RNA rather than DNA. The flu and HIV are also RNA viruses, and they both share a tendency to mutate. RNA is synthesized by polymerases, enzymes that aren’t as good as the enzymes that synthesize DNA when it comes to correcting for mutations. As a result, RNA viruses have a mutation rate up to 100 times higher than mutation rate for DNA viruses. Up until now no one knew if Ebola, a filovirus, shared this ability. 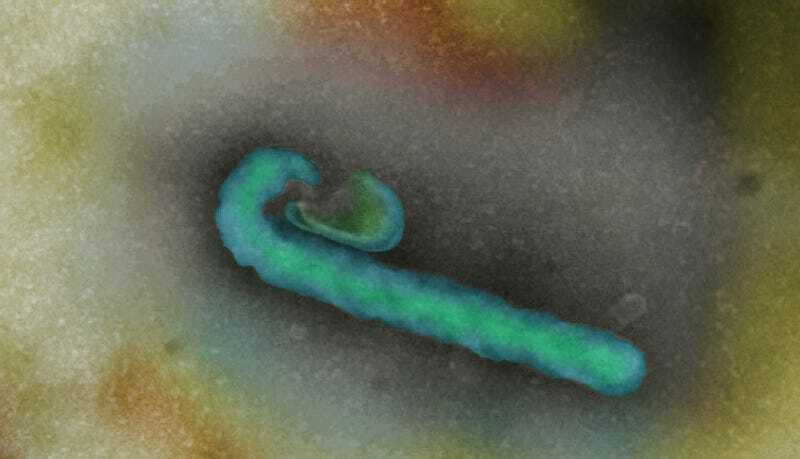 To find out, researchers used sequencing and a virus tagged with a gene encoding for fluorescent green protein to see how frequently the Ebola virus mutated. They found that it shared the propensity of most RNA viruses to mutant more frequently than DNA viruses. This ability isn’t necessarily bad. A mutated virus isn’t always a more virulent virus. A mutation in an RNA virus could also make it milder and less deadly. Unlike other RNA viruses, however, the researchers found that Ebola didn’t have much genetic diversity. This indicated that the virus didn’t take mutation well. If it departed from its genetic sequence, it killed itself off. This is why the researchers settled on ribavirin as a treatment. Science hasn’t established exactly how it helps treat hepatitis C, but it does drive mutation in viruses. When the scientists tried treating Ebola-infected rats with ribavirin, they got a survival rate of between 38 and 75%, compared to a 22% survival rate for untreated mice. Both groups of mice lost weight after being infected, but the treated mice began to regain their weight as the treatment went on. Even the mice that died lived longer than they would have without the treatment. Alas, when the group tested the treatment on monkeys, there was still a delayed time of death for the treated group, but it wasn’t enough of a difference between the treated and untreated group to consider ribavirin a good treatment option for Ebola. Instead, it’s proof of principle for a possible viable new strategy for combatting Ebola. If we can find a drug that works in primates the way it works in mice, we might be able to turn the virus’s ability to mutate against itself.